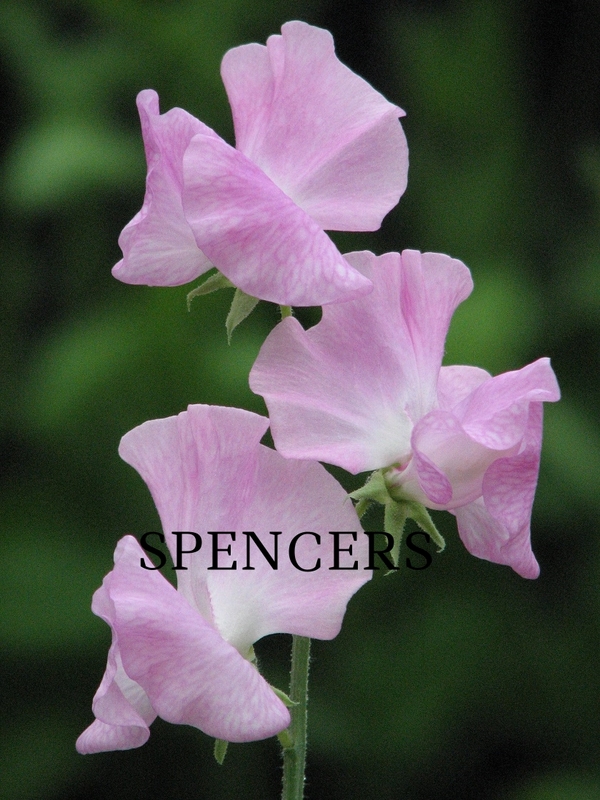 Owl's Acre Seed carries a wide range of traditional and new sweet pea varieties. Whether you are an exhibitor, cut flower grower or home gardener, we have seed to suit your needs. Broadly speaking, our sweet peas can be categorised into the modern, large flowered Spencer types, the more informal but highly scented and abundant Heirloom varieties, Early Flowering types that can give bloom in early March from an autumn sowing, and Dwarf types, ideal for container growing. The thumbnails below will take you directly to our product pages, or scroll down further for more information to guide your seed selection. If the number of sweet peas available is confusing and you are unsure which varieties you want, why not choose one of our collections of sweet pea seed? These are attractively packaged and make great presents. The large flowered Spencer strain of sweet peas dates from 1900, and has remained the most popular and widely grown ever since. Available in a huge range of colours and a variety of 'fancy' types with patterned or bicolour flowers, they offer something to cater for every taste. Most varieties have the lovely sweet pea fragrance which has done much to ensure the lasting popularity of flowers. Generally speaking, the blue shades and the lighter colours have the strongest fragrance, while the dark reds and scarlet sweet peas can be almost scentless. Visit the Resources page to learn more about the development of Spencer sweet peas. Most of the varieties listed in the Heirloom category are technically classed as grandifloras. The term grandiflora came into being to distinguish the new sweet pea varieties being bred by Henry Eckford and others in the late C19th, which had larger flowers than had been available previously. By modern standards, flower size is quite modest, and so these varieties are generally marketed as 'heirloom', 'antique', 'heritage', or 'old fashioned' to avoid any confusion. The name Lathyrus grandiflorus refers to a different species entirely. These antique, or heirloom sweet peas produce masses of small highly scented flowers. Superb for informal garden decoration, but not recommended for cordon culture. Plant a clump in the border and let them sprawl at will or scramble over low shrubs or netting, filling the garden with their wonderful fragrance. The varieties 'Cupani' and 'Unique' make bushier, lower growing plants than the others and are particularly suitable for growing in containers. Few of these heirloom varieties of sweet pea have weathered the passage of time unchanged, and the true origin of some of the forms currently available is uncertain. The names presented are those in current commercial use, and an opinion of their true current status is indicated in the text. For more detailed information about heirloom varieties and the history of the sweet pea, please refer to our Resources section. A booklet dealing comprehensively with these popular garden plants and growing them from seed is also available here. Bred specifically as a commercial cut flower strain of sweet pea for winter production, Winter Sunshine™ Sweet Peas have proved versatile and productive under a wide range of conditions. In the UK, light levels over the winter months are too low to permit very early flowering, but they still start to bloom several weeks earlier than other types, typically in March under glass. The varieties listed are exclusive to Owl's Acre Seeds, and have been chosen as the most reliable performers under sub-optimal light conditions. They are far superior to Winter Elegance and other older strains, and have a more uniform flowering response. It should, however, be noted that winter flowering varieties benefit from a higher standard of crop management than that required by later flowering sorts. The rapid flowering response of these sweet peas make them valuable for countries with a short growing season, but they are also unrivalled for winter flower production in Australia, California, the warmer areas of New Zealand, and other regions with a Mediterranean type climate. 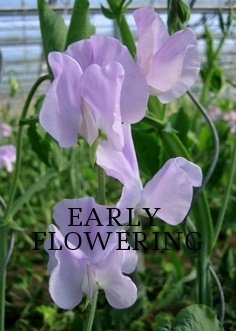 Bred specifically as a commercial cut flower strain of sweet pea to follow on from the popular Winter Sunshine series. With a flowering period intermediate between the winter flowering sweet peas and the summer flowering Spencer varieties, the Spring Sunshine strain perform particularly well in warmer climates or under glass in the UK. These are trailing varieties which grow to only a few inches tall. They are ideal for container growing. Various strains of dwarf sweet peas have been raised over the years and released under a wide variety of names. We carried out trials of all the strains available, reselected the best to improve uniformity, and added new colours. Initially launched with great success at the 2006 Chelsea Flower Show, these are now available as the Cherub™ range. The 'Sprite™' range of early flowering dwarf sweet peas were bred by crossing the 'Winter Sunshine™' series of commercial cut flower sweet peas with the award winning 'Cherub™' range of dwarf sweet peas. The 'Sprite™' varieties combine the large flowers and ultra early flowering habit of one parent with the dwarf stature of the other. They make excellent plants for tubs, hanging baskets and window boxes, or can be planted directly into the flower bed to give a carpet of colour. These are trailing varieties which only grow a few inches tall, and so can be prone to rotting under unfavourable conditions in our rather damp climate. To give of their best they need plenty of sunlight, good drainage and plenty of air movement. This makes them ideal for container growing, and 3 or 4 plants in an 18" tub will give a spectacular display. They unquestionably have great potential as patio plants or in hanging baskets or raised beds, but may prove less reliable in the border unless our summers continue to get warmer and drier. Plants should be dead headed regularly to ensure a long succession of flower. Sprite™ sweet peas can be grown in a similar manner to the more familiar Cherub™ strain, but will flower several weeks earlier.